And now, ladies and gentlemen, I have an important message for you from Psychotic Monk. Psychotic Monk: Practitioner of highsec PvP, CSM candidate, Belligerent Undesirable, friend of the New Order, and... philanthropist? It's true. CCP created a charitable program to allow EVE players to send money to the victims of the typhoon that hit the Philippines last month. Psychotic Monk has announced that he will be running a promotion for this cause. True to form, his promotion involves suicide ganking a bunch of carebears and broadcasting it on his Twitch.tv stream. Why: All donations of isk or plex go to Hurricane Haiyan through the CCP Plex4Good program. Well, sort of. 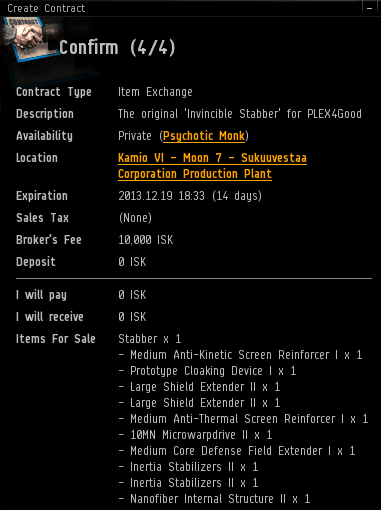 This is not the Stabber Fleet Issue with which I have bumped so many miners as Saviour of Highsec. This is actually the original "Invincible Stabber". In early 2012, several months before the creation of the New Order, I first began to experiment with the possibilities of bumping miners out of the Arvasaras system ice field. I used a regular Stabber. It still has the original fittings. If you win the auction, you could own a piece of EVE history! Will the ship be invincible in your hands? Well, it's like I always say: It's not the ship--it's the man. 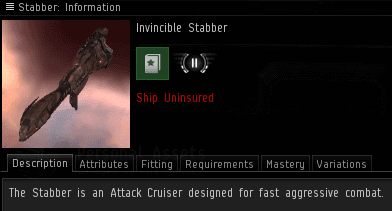 Nevertheless, the original Invincible Stabber, true to its name, was never destroyed. It was often the target of gank attacks. One miner, a carebear named Kharmha, was driven so batty that she dummied up a fake killmail on Battleclinc. (Unfamiliar with suicide ganking mechanics, she had herself using a Drake with heavy missiles.) But fake killmails are no substitute for the real thing, and her fellow carebears were crestfallen when they saw the Invincible Stabber continue to undock despite seeing the Battleclinic mail linked endlessly in local. That would be bad "Kharmha". If you're interested in some good karma, then perhaps you'll join Psychotic Monk for this event. Why don't you put your name up, if your prepared to make a statement like that. What's wrong with people having fun at the event, and giving to a good cause? Read next time before posting. Thank you Capt Starfox for making it clear. We already know that non-compliants have no understanding of rules. Capt Starfox clarified, but how often do bot-aspirants recognize, observe and respect rules? I for one will be in participation, and I hope we get some juicy targets that can convert to NUMEROUS PLEX. Monk, you have my Talos, Cat, Brutix.....whatever. And for the naysayer at the top. Learn to read rules and devblogs, idiot. I'll be there Monk. You can count on the N.O./NODD to help out. I know there has tobe a few people out the besides Sarah that you would like to POD me. Count me in. 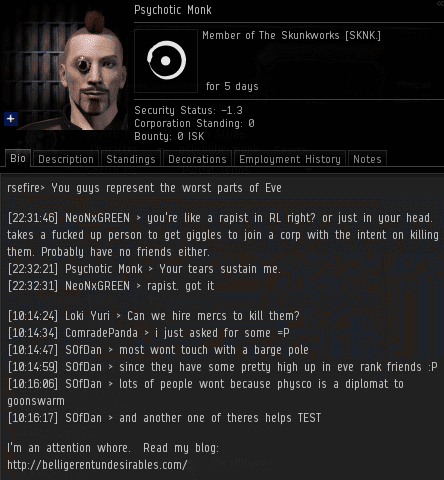 I'm always willing to help out my fellow human beings, whether they be in highsec or the Philippines. Psychotic Monk has an obvious personality flaw due to his own perception of his childhood being that of disaster, shame and regret. Also, did anyone see the Sharks game last night? Crazy. Pretty rude, Mr. Anonymous. Around 108b raised last night for charity ganking for good, before matching funds. Mining for good did something like 170 million. although without miners the event (ganking for good) would have been pretty lame. amazing showing of support for a great cause. approx. 109 BILLION isk value donated.